I’m self-proclaimed lipstick fiend. But since I have dry lips, there are times (too many for my liking) where I’m forced to resort to using a lipgloss for the day simply because my lips are too dry for pretty much any kind of lipstick unless I want the formula and color clinging to existing every dry patch. No matter how much I exfoliate and hydrate with a balm, my lips just have their extremely dry days and I’ve come to accept that. As a result, my lipgloss collection is just as large and varied as my lipstick one. Another addition to said collection is this LAB SHINE Diamond Collection Lip Gloss I got from the Make Up For Ever flagship boutique opening a couple of months ago. 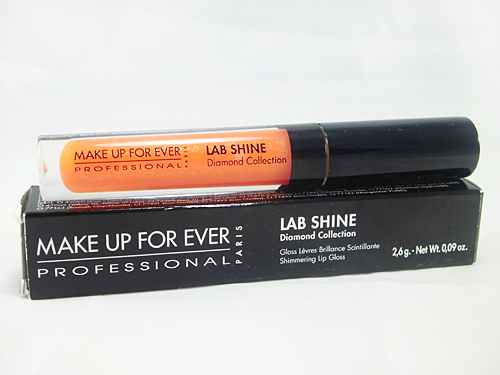 Product info: The Lab Shine Lip Gloss offers spectacular and intense shine. Especially designed to achieve an ultra-bright effect, its silky brush ensures an optimal and dazzling coverage. The Lab Shine is available in 3 collections, in a wide range of 35 creative colors and effects: – The Diamond Collection offers a sheer coverage, natural effect and a sparkling shine. – The Star Collection offers a medium coverage with a pearly shine. – The Metal Collection offers a high coverage with a chrome shine. As the product description stated, there are a total of 35 shades which make up the entire LAB SHINE lip gloss line. The Diamond Collection, which this gloss is from, has 12. 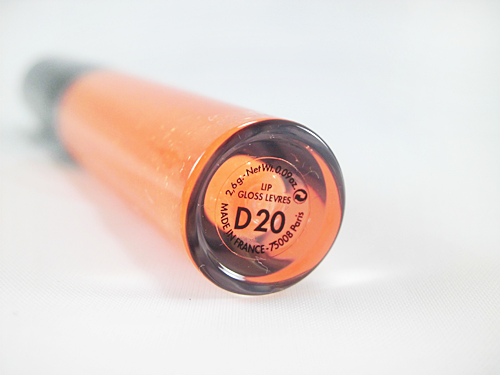 I received mine in the shade D20 Tangerine. I’m usually not the biggest fan of orange or coral shades when it comes to lip products, just because I think they don’t go well with my skin tone, but since this is supposed to be a sheer gloss then I wasn’t too worried as I figured the color would just be very subtle. The applicator is almost like a traditional lip brush and has soft, synthetic bristles. I like the applicator because it allows me to be super precise when applying the gloss. I actually find it’s a lot more accurate and precise than applying with a regular doe foot applicator – at least in comparison to the ones that aren’t tapered. Unlike a lot of glosses, this one isn’t actually very sticky and it’s consistency isn’t too thick either which makes it easy to apply. You can see flecks of glitter in it too. Not surprising as the Diamond Collection glosses are part of the “shimmery” category. They’re not large, but they’re visible. 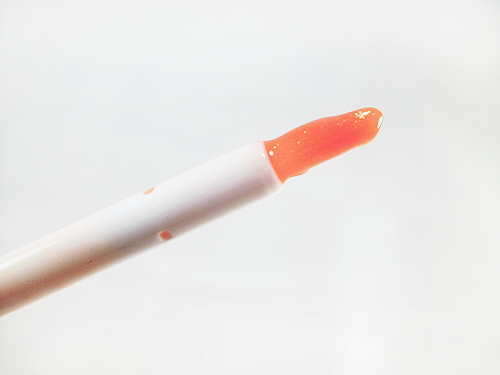 When you first apply it, there is an orange tint that’s subtly visible at first. But as you start to spread the gloss, the color gradually fades. 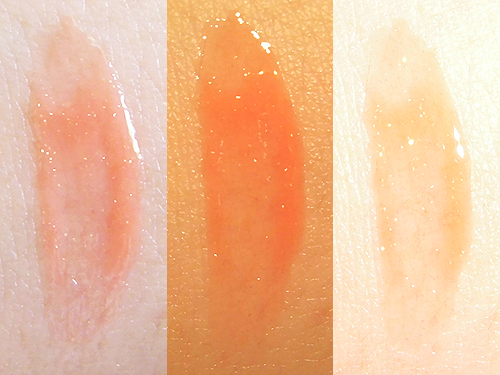 In real life, as compared to the pictures above, you’ll be able to see the tiniest hint of orange still left. But that’s unless you’re staring at my lips close up also, haha. Staying power is just like a regular lip gloss. It’ll start to disappear after even some light eating and drinking and it’ll be completely gone after a proper meal. As someone who doesn’t like touching up my lipgloss or lipstick often, this is where I’m disappointed but at the same time, not surprised. The fact that it’s so sheer is one reason for the lack of staying power. What I am liking though is how moist and healthy the shine makes my lips look. You’d never think my lips were actually dry just before I put the gloss on! The added glitter also seems to make my lips look a little fuller or plumper, I think. I know this product is meant to be sheer, but when it comes to glosses, I always want something more pigmented. To me, I almost feel like it’s a waste of money buying a lip gloss or lipstick that can hardly be seen. I haven’t tried the other glosses from the Diamond Collection, but I think it would be pointless to buy more than one shade from the collection if they’re all this sheer and you might as well have your pick from the Star or Metal Collection. Nonetheless, this is a good product if you want very little to no color when it comes to your glosses, a decent amount of shimmer, and don’t mind retouching a lot. My only suggestion is that if you’re looking for a lip gloss that ticks all those boxes, you can easily find a much cheaper alternative from other brands. I’m sure I’d be a lot happier with a gloss from the Star or Metal collection, so I’d love to try one from them soon! Formula is not sticky or thick. The glitter flecks are just right in size. Applicator allows you to be precise when applying the gloss. Makes my lips look hydrated and healthy. Lasting power is just like an ordinary lip gloss. It disappears after light to moderate eating and/or drinking. I’m not a fan of sheer lip glosses and like them more pigmented than this. A little pricey for a gloss that doesn’t last long.